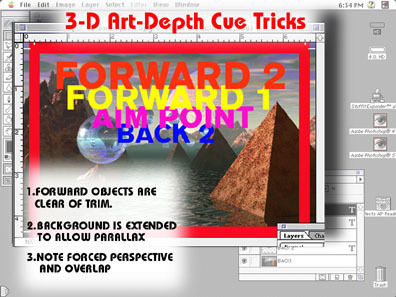 Conventional graphics can easily be converted to effectively display the illusion of depth when certain points are followed during art preparation. This scale can be followed fairly loosely. If you are unsure of how much extra to include, remember that more is better as photo retouch work or cloning can incur additional creative costs. If possible, backgrounds should avoid solid colors or horizontal stripes. These two situations do not provide a depth reference to the observer. An alternative to a solid color would be to add texture such as crumpled paper to the color. If objects are cut out of the background to be layered with the background, the removed area of the background must be cloned or retouched to cover the void area. Elements that are supposed to project forward of the aim-point or surface should not be encroached or be bled beyond the trim. If the element is trimmed, confusing depth cues will be observed and the illusion of dimension on that element will be lost. Element that overlap even slightly are good depth cues and will enhance the illusion of depth. Forcing perspectives can enhance the illusion of depth. An example of forced perspective is where objects appear to get smaller the farther they are from the observer. Psychologically, cooler colors tend to recede and warmer colors tend to project. Logos or important type and copy should be composed to be on or near the aim-point. The same rules for type, resolution and client approval apply. Creating two-dimensional mediums that deliver 3-D impact.